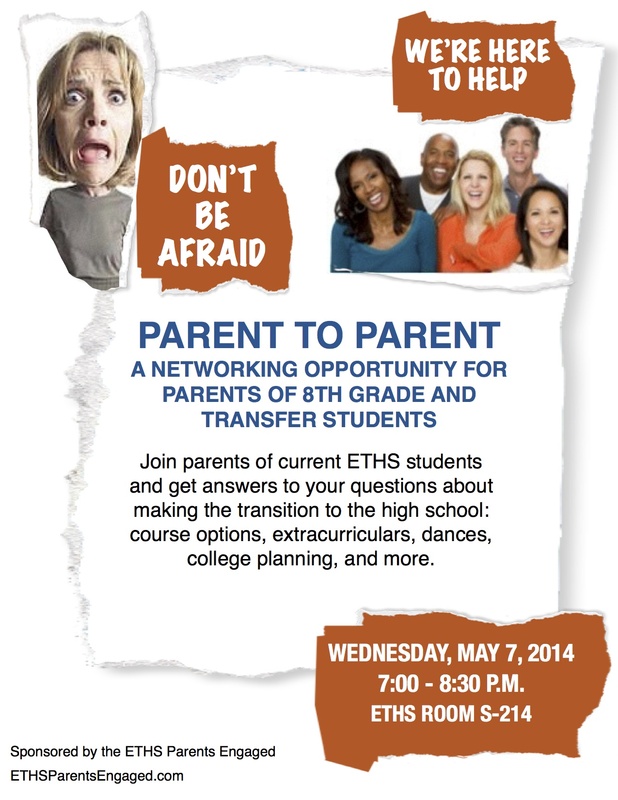 Parents/guardians of eighth graders and transfer students are invited to attend the annual “Parent-to-Parent” program, sponsored by ETHS Parents Engaged, which will be held on Wednesday, May 7, from 7:00 – 8:30 pm in Room S-214 at Evanston Township High School. Parents of next fall’s ETHS freshmen are invited to hear from and speak to parents of current students about high school life, anything from course options, to sports, to the Homecoming Dance. Experienced parents will be on hand to answer questions, including how to effectively use resources at ETHS and how best to navigate the high school years. If you are a parent of an older ETHS student, please join us,any ETHS parent is welcome to join in the conversation. Also, while this program is geared toward parents and guardians students new to the high school, all ETHS parents and guardians are invited to attend this free event – please feel free to come and just listen. No reservations are necessary and refreshments will be served.